Route Browser is a fun but very useful add-on for the Logbook Pro. Using the data you've already entered and complemented by a comprehensive airports database, Route Browser makes it simple through maps, charts and reports to display your flights and see distances flown. Tightly integrated with Logbook Pro, Route Browser is as simple to use as it is powerful. Complete customization and easy to use filters let you graph just the flights you want in the colors you want. Route Browser now works with Google Earth. With Route Browser you can turn your logbook data into a Google Earth display where you can revisit the terrain you flew over down to zooming into the actual airport! And because Google Earth runs on Mac and Linux computers, you can share your trips with anyone! 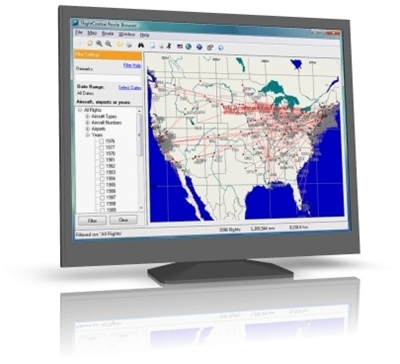 Graphically display your flight history in maps, charts, and reports. Easy Integration - Directly reads from your existing Logbook Pro logbook file - No conversions necessary. Comprehensive Airports Database - Over 20,000 U.S. airports and 4,000 international airports make it easy to get started. Plus you can easily add your own anywhere around the globe. Automatic Distance Calculations - Track not only how long you've flown, but also how far. Simple Database Filtering - Easily view flights by aircraft type, tail number, date or by specific keywords in your remarks field. Flexible Route Configuration - Specify the way you track your route (any combination of from/to and route fields). New Airport Wizard - Automatically scans your logbook and alerts you to unknown airports and gives you options to locate and and add your entries to the database. Customizable Map Display Options - Configure map colors and control display of grids, states, rivers, lakes and a map legend. Customizable Route Options - Configure labeling colors and fonts for any routes. Flexible Map Display - Zoom, unzoom and set the default (Home) view. Custom Route Display - Enter your own route to display in addition to (or instead of) those in your logbook. Flight Detail Information - Click on any route or logbook entry to see details about trip including distance and average speed. Integrated Internet Links - Integrated access to Internet maps and aircraft and airport databases. Map Export - Save map images to the clipboard, as image files (.jpg or .bmp), or set as the computer's wallpaper.
.: Windows XP, Windows Vista, Windows 7, MAC1 . Both 32 and 64 bit editions of Windows supported. Note 1: Your Apple computer must be running Microsoft Windows in its own partition (boot camp) or an emulator such as VMWare Fusion, Parallels. Once Windows is loaded Logbook Pro can be installed within Windows and run normally. To use Google Earth features you must first download Google Earth FREE from Google. Click here to download now. License allows install and unrestricted use on one computer. Evaluation of Route Browser will show a small sample of your Logbook Pro database to experiment with the functionality of the software prior to purchase. This product is fulfilled via download from our web site. If you are already evaluating this software then a new download or install is not required as all you need to do is enter the issued registration information to lift evaluation restrictions and continue using the same software and data. Purchasing this product issues a registration code only. No physical products are shipped.